Steve Bishop examines how an internal battle within the British Tories has led to the carnage, chaos and confusion that is Brexit. PERHAPS ONLY FOUR THINGS are clear about the Brexit crisis and chaos gripping Britain — the "Leave" campaign lied, the "Leave" campaign cheated, a small majority voted to leave the EU and the ruling Tory Party has torn itself asunder. If some Australians are confused about Brexit they can take heart — many Poms are too. Prime Minister Theresa May, who voted to stay in the EU, has spent two and a half years since the Brexit Referendum trying to find a way for the UK to leave. Days before becoming chief Brexit liar in 2016, Boris Johnson wrote a newspaper column (not published at the time) saying he would 'back the prime minister' (David Cameron), who was urging people to vote to remain in the EU. And Labor leader Jeremy Corbyn? He voted against the 2008 Lisbon Treaty, which strengthened the EU in 2008, but says that in the 2016 Referendum he voted to remain in the strengthened EU. An issue which has split the country was never a major concern for the British public before the 2016 Referendum. As recently as 2014 only 4,376,635 people in Britain – less than a tenth of the electorate – voted for the UK Independence Party (UKIP) in the European elections. A poll in 2014 showed that the EU did not feature as a major issue for people considering the most important issues facing them for the 2015 general election. Only 11% said it was the most important. It was placed seventh is the compilation of issues. "I thought it right to hold the Referendum because this issue had been poisoning British politics for years"? “While parents worried about childcare, getting the kids to school, balancing work and family life — we were banging on about Europe." Matthew d’Ancona, former Spectator editor and chairman of the liberal-conservative think tank, Bright Blue, traces the uprising within the Party to a speech by former Chancellor of the Exchequer, Norman Lamont, in 1994. In October 2011, Cameron defeated a bid in Parliament to grant a referendum on EU membership, despite more than 80 of the 306 Tory MPs defying a three-line whip. Then, in 2013, Cameron thought he had the momentum and numbers to end this long-running civil war and promised that if the Conservatives won the next election they would seek to renegotiate the UK's relationship with the EU and then hold a referendum on whether to remain as a member. People who had previously shown little or no interest in the UK’s membership of the EU were pushed to choose sides — and many have done so with a fierce intensity. Instead of ending the Tories’ internal civil war, the Referendum has ignited battles that have poisoned many relationships and friendships. A poll has found that a quarter of "Leave" voters believe they were misled during the Brexit campaign. That extrapolates to more than four million of the 17 million who voted "Leave". The majority was less than 1.3 million. In the survey by Opinium, just over a quarter of Brexit voters said they were misled by promises made during the campaign. If we vote to leave the EU… We will be able to save £350 million a week. We can spend our money on our priorities like the NHS, schools and housing. Official UK Government statistics show the average annual net contribution for the years 2012 to 2016 was £8.1 billion — or about £156 million a week. The "Leave" campaign was warned not to use the figure of £350 million by the Government because it was misleading but it continued to do so. The former boss of the Vote Leave campaign, Dominic Cummings, admitted after the Referendum that “all our research and the close result strongly suggests” that "Remain" would have won without the advert. The big lie worked so well that even now almost half the British public still believes the false claim that the UK sends £350 million a week to the EU, despite persistent attempts to debunk the myth. A recent study by King’s College London of attitudes to Brexit found that 42% of people who had heard the claim still believe it is true. But the number of migrants from the EU for the ten years from 2007-16 was actually just over half that figure — 1,103,000. "Turkish membership in the European Union is not realistic in the foreseeable future." 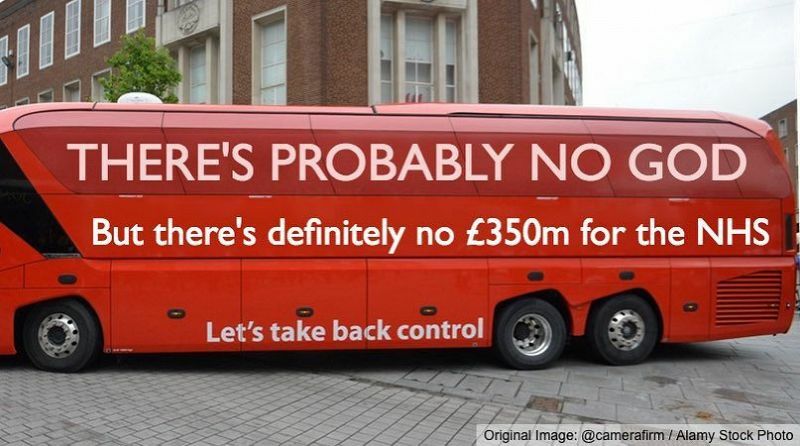 There were more lies and, on top of this blatant deception, the Vote Leave campaign exceeded the budget set by the Electoral Commission to ensure a fair and balanced campaign. "did not adhere to the legal spending limits. These are serious breaches of the laws put in place by Parliament to ensure fairness and transparency at elections and referendums." Perhaps there is one more certainty about Brexit — there is more chaos to come. The "trade deals" argument is one of the most absurd justifications of Brexit. You can read more by Steve Bishop at stevebishop.net.